Design and development of an optical fiber based sensor usable for monitoring of landslide. Validation of the system developed, comparison with the existing conventional system and future use. Procurement of the materials and equipments related to the project work. Laboratory study on the designing and fabrication of the optical fibre based sensors. 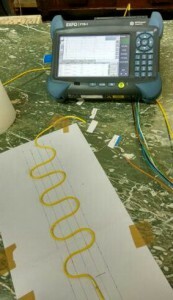 Measurement and testing for the effectiveness of the design of the sensors. Development of the prototype Multiplex network system of the optical fibre based sensors. Testing of the system in the Laboratory for its efficiency. Modification if required in the process. Comparison of the sensors with the traditional sensor system. Process for final field trial in a landslide prone area. Selection of the plot for trial run of the system. Field study of the particular plot selected. Field installation of the network system of the prototype developed. Acquiring data obtained from the multiplex system. Comparison with traditional system. Analysis of the data obtained, verification of the data and comparison with other traditional system and feasibility at the site. Integrating with the wireless system for real time transmission of data to far away places. Writing final conclusion and report. Patent.